AB 5 (Gonzalez D) Mandates certain hiring requirements for businesses. AB 199 (Chu D) Applied prevailing wage to private construction (not, this bill is not dead but has been amended in a manner that we no longer oppose). AB 378 (Garcia, Cristina D) California Cap-and-Trade on Greenhouse Gases. AB 909 (Steinorth R) Mandates that trauma kits be installed in private buildings. AB 975 (Friedman D) Greatly expands wild and scenic rivers designations. 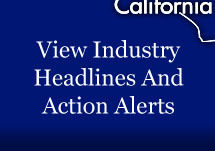 AB 1059 (Gonzalez Fletcher D) Attempts to Bans Dual agency commercial real estate firms/transactions. AB 1506 (Bloom D) Residential rent control: Costa-Hawkins Rental Housing Act. SB 2 (Atkins D) Applies a $75 tax to all recorded real estate documents. SB 224 (Jackson D) Overturns recent CEQA court. SB 640 (Hertzberg D) Sales tax on services. SB 705 (Allen D) Solid waste: expanded mandate on certain packaging. SB 775 (Wieckowski D) California Cap-and-Trade on Greenhouse Gases.